I’m bringing back all of my old series this week! Grab your carts! It’s time for another virtual shopping trip! This time we’re headed to one of my favorite thrift stores: Savers. I shop here almost every week and I buy something pretty much every time I go. For those of you who have never been to or even heard of Savers, it’s similar to Goodwill. I’d say it’s slightly more organized, but the prices are sometimes a little higher. They don’t do color tag or half off days either. I think the best deal they routinely offer is 25%-off on Fridays. Occasionally they do 50%-off clothing and home goods on holidays, but those days are usually ridiculously crowded. Anyway, as I already mentioned I stop by almost every week, so today I’m going to take you on my usual route through the store. 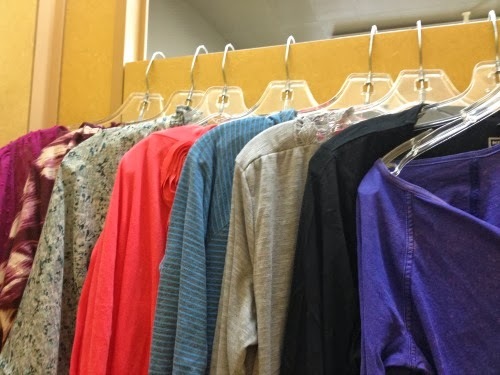 I always start at the clothing racks. I usually just look at shirts, but occasionally I look through the dresses and pants too. I ended up finding eight shirts worth trying on, so the next stop is the fitting room! After trying all of them on, I end up only liking two of the eight shirts…better than nothing! Now that we’re done with clothes let’s head to the home goods section and I’ll share my picks from around the rest of the store. 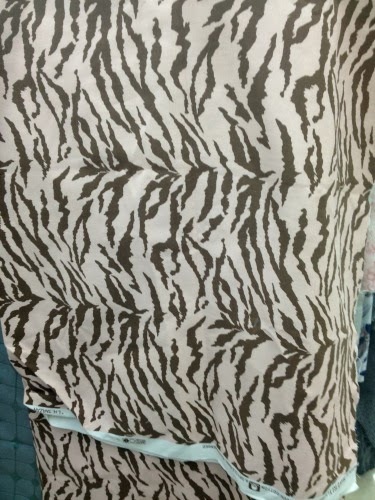 In the fabric section I found about a yard of this Waverly pink and brown zebra fabric for $1.49. There was definitely enough to make at least 1 throw pillow. 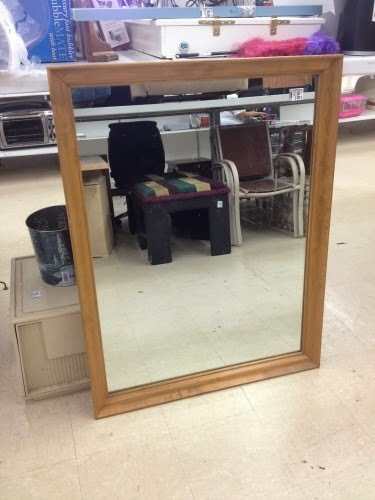 This large mirror was only $14.99, which is a great price for the size. The frame is real wood so you could leave it as-is or paint it. 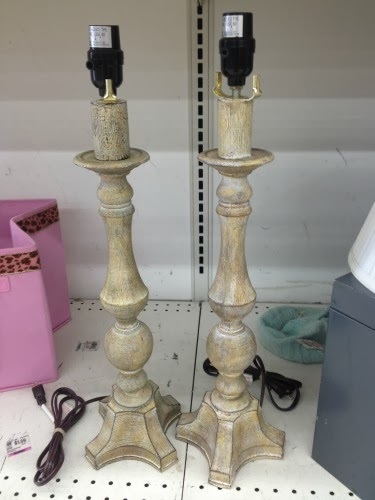 It’s hard to find a pair of lamps in the thrift store, especially nice ones, so I really liked this pair ($4.99/each). I actually kind of like the finish, but you could always spray paint them a different color. 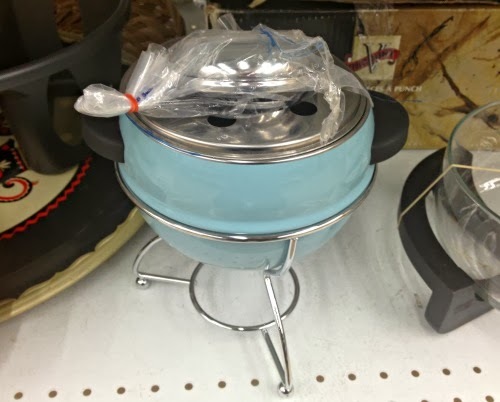 In the kitchen section I found this brand new fondue pot. It’s a fun color and it still had the protective plastic on the inside, so it’s a good buy at $9.99 (although it’s not a killer deal). 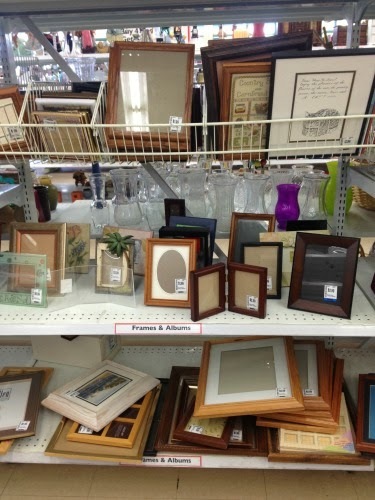 The next aisle is full of frames! It’s a great (and cheap) way to start or expand a gallery wall. Most are $1.99 - $2.99. This pair of blue and white flower pots reminded me of Linda from Calling It Home. The large one was $4.99 and the smaller one was $2.99. 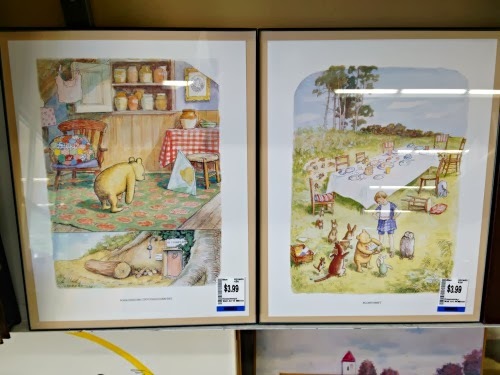 How cute would these Winnie the Pooh prints look in a nursery?! The frames were cheap plastic, but they could be easily replaced. Just the prints are worth $3.99/each. My last stop is always the book section. I love reading and already have a massive collection of books I want to read (that I’ve mostly bought at thrift stores), but I can’t stop myself from looking and buying more. The books range from $1.99 - $2.99, but if you buy 4 books, you get the 5th for free! I bought the two shirts that I mentioned above ($4.99/each), a pair of ironstone platters ($2.99/each), and this cherry blossom artwork ($3.99). The ironstone platters will join the rest of my collection in my china cabinet and I think I’m going to hang the cherry blossom artwork in the gallery wall in the living room. OK, let’s hear it – which item is your favorite? Or which item do you think I’m crazy for buying/not buying? 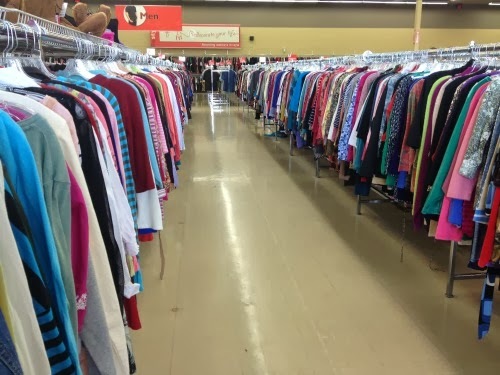 Have you ever been to a Savers store? You can check out the rest of my shopping trip posts here. I love thrifting and go to GOODWILL a lot! 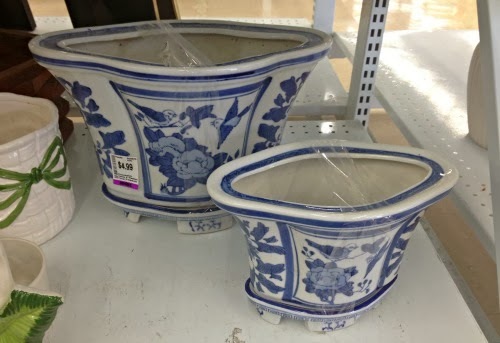 I would have grabbed those Blue & white pots for sure, I have a 2 that I also got from thrifting. Can't wait to see you stash displayed Sam! 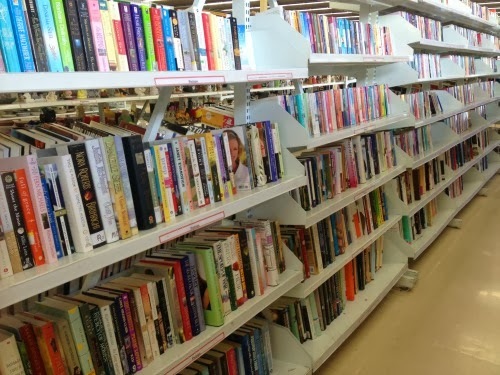 Savers is clean and well merchandised, and the prices reflect that. But I like it for those reasons too. Tonight I bought a Black Horse/White Market skirt, so cute, for 9.99. Not a steal, but it's like new, and I am pleased!